Xmas means many things, and one of the things it means is that we watch It’s a Wonderful Life, and for years it meant we put in the old VHS tape that the wife has and let it roll. Last year I ended up getting a VCR out of the closet on Christmas Day and connecting it to the old HDTV and watching it in all its glory. This year I got as far as getting out the VCR, and before finding all the right cables, I figure I’d check if there was another option. The first thing I did was turn on the Wii and checked Netflix. 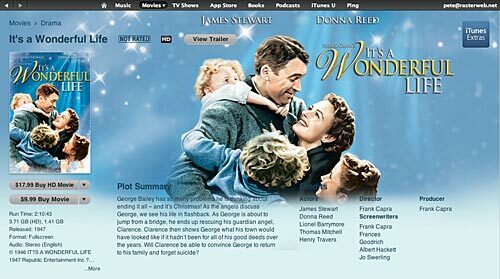 It’s a Wonderful Life is not available for streaming, so that was a dead end. Netflix would have been the easy option, since I’ve already got a streaming account, but since it wasn’t available, I moved on to iTunes. It’s a Wonderful Life is available on iTunes, but the last time I checked on iTunes video rental, there were all sorts of crazy restrictions I didn’t want to deal with, so I never seriously looked at it. Well, I don’t know if the Amazon option was better, but the film was available for $9.99, the same price as the “non-HD” version on iTunes. At this point I didn’t feel like doing a comparative analysis of the various online video rental systems and just went with Amazon, assuming it would be more open than Apple. There was a link or two about downloading, so I figured that was a good thing, and with one click, I bought it. I ended up streaming it so we could just watch is ASAP, and we did, and the quality was good (well, better than an old VHS tape anyway!) and it all just worked. After the movie I wanted to check on the downloadability, and discovered that Amazon has a player that is only available on Windows. Bloody Hell, what is this, 1999? They also have a list of 350+ Amazon Instant Video Compatible Devices… none of which I own. The Roku player is on the list, and I considered getting one a few years ago, but after Netflix became available for the Wii, I forgot about it. I tend to use the Wii or my MacBook for most of the video streaming we do, so I never thought I needed a dedicated device. So now I’ve got a video I own through Amazon, that I can’t download, but can stream. I’ve probably been an Amazon customer for 15 years, so I guess I should trust them, but It’s a Wonderful Life is over 60 years old. Will I be able to watch it 30 years from now? Should I even worry about such things? While buying music online went from a DRM mess to a more open world, I don’t know that video will go the same way… And yes, there is the pirating option, but personally I’m not a fan of that approach. Blame it on my desire to see things move towards openness. Posted on Monday, December 26th, 2011 at 6:00 am. Subscribe to the comments feed. Both comments and pings are currently closed. Post on your own blog.